You know hockey season right around the corner when movements happen with coaches, broadcasters, etc. In the past couple days, the Portland Winterhawks made some additions when they brought in Nick Marek as their new broadcaster. Marek comes from the North American Hockey League (NAHL) where he was the broadcaster for the Lone Star Brahma Bulls. He was also their social media person in charge of the website and so much more. At 26, he is very young, so he is looking to build a future here; his skills on the web are important to the Hawks, as they only have four under Senior Vice President Kelley Robinett. None are experts like Marek when it comes to web design and social media. He is slated to be here next week and will be thrust into the thick of things will camp underway and trips to Everett and Tri-City for the tournaments. He looks to test the app during the Tri-City tournament Thursday and Friday, September 6 and 7. This year, there will be no Aloha Papa John’s pizza event so some of the rookies are safe from having to make pizza. The Hawks also swung doors out and opened them again with Danny Flynn moving on to be the scout for the Columbus Blue Jackets. Flynn was just here one season, but had a huge pedigree on his resume. It was surprising that Flynn was here at all due to his wealth of experience. Same could be said just a week later with the announcement that Don Hay was joining the Winterhawks as an assistant coach. 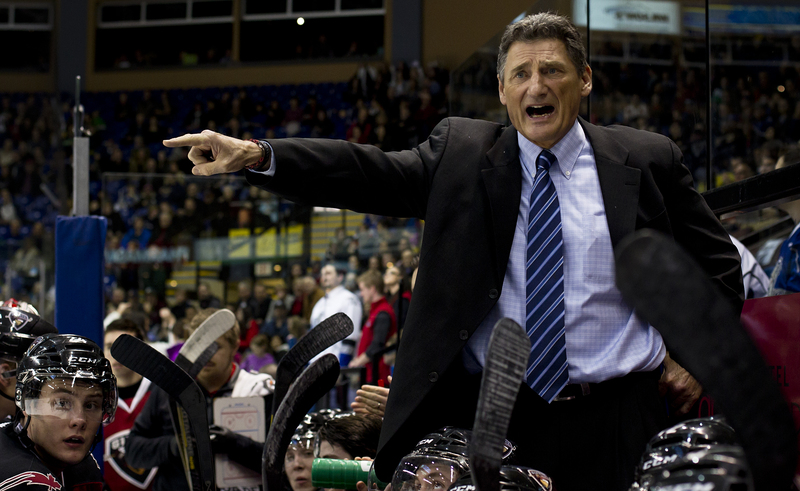 Hay was a part of Kamloops in 1986 as an assistant and head coach in 1996 where he won a Memorial Cup and again in 2017, but unlike 96, was unable to rekindle the magic there. Hay is best known for his stint in Vancouver 2004 through 2014, where he always had a strong team and won a Memorial Cup in 2006. He runs a gritty team, unlike the finesse of Johnston and is something the Hawks have been short on in the past few years as they run to the WHL Championship. This might be the ingredient they need especially in a lean year that is expected this season. Lots of goals, assists and points left the squad this coming season as they either maxed out in age or were signed to NHL deals. They expect a good team, just not championship material. No one is sure how long Hay will stay with the Hawks; Portland has a reputation of developing talent from the top down and he may be one and done. Others who have down well out of the Hawks organization, including Garry Davidson, who left to go to Everett as their GM and has done well. Travis Green is the biggest success story as the assistant coach of the Hawks during Memorial Cup runs; he was tapped to run Utica of the AHL and them moved to be the head coach of the Vancouver Canucks. Matt Bardsley was tapped to be the next GM of Kamloops recently and of course, Mike Johnston left the Hawks to be the head coach of the NHL Pittsburgh Penguins. It will be interesting to see how the WHL works out this year; several teams sent many players moving to shore up for a WHL title in the largest ever movement. The WHL clamped down with regards to 16 and 17-year-old players who were the bulk of the moves last season. No more 15 and 16-year-old moves and 17-year-olds can only be moved if they request a trade. This will affect the trade deadline this January for sure and will be interesting to see how the squads do. The Eastern Division saw the most moves, which once again looks to be a weak division. Portland should be at least third in the US Division behind Everett and possibly Spokane. Dark horses are Portland with Shane Farkas, who will assume a big role in the Portland nets after limited action last year and Beck Warm in the Tri-City net, who saw a good share of games but didn’t have a strong defense to help him out. Spokane netminding is always suspect but with the GM moving on last year after a ton of time at the helm, Spokane will be a tough team to defeat this year. Portland had a strong camp with many fans talking about several players that won’t be part of the team as they are still too young, but the camp was solid again. They ran a scrimmage for a packed house at Winterhawks Skating Center on Sunday and followed it with Fan Fest, which was well attended! This week, they will remove most of the young players and assemble a team set to take the ice in three weeks’ time. Three games will take place before the team comes home so fans will see a more gelled team at Moda Center come September 29.